I probably should have waited until fall to review this fall-themed book, but I just received it, and couldn’t wait! A chilly February day is a good time for some hot spiced apple cider, though, so let’s have some as we look at today’s book. It’s such a delight to add a book by a writing friend to our list of Perfect Picture Books! Opening Sentences: Come to the cider mill and you may see – a basket of apples, red, green and yellow. 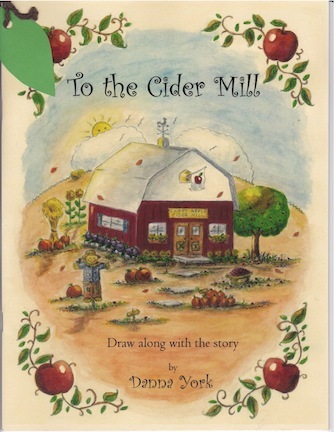 Synopsis: In rhyming couplets (except for the first page) the book takes readers on a visit to a cider mill in the fall. The main character is the reader, as the book is addressed to “you” throughout. It tells of the things a person would see on a visit to a cider mill. There isn’t the usual conflict/concern that must be resolved, it’s simply a day at a mill. The unique and delightful thing about this book is that it is participatory. The illustrations are presented as coloring pages for the reader to color as they wish, and the page facing each illustration is left blank with a prompt for a further illustration to be drawn by the child, such as “Some apples rolled out of the basket. Draw them here.” This goes beyond being simply a coloring or activity book, with the story and the gentle rhymes that children will enjoy long after they have colored in the pages. Activities/Resources: This book is really its own activity, with all the coloring and drawing. There is also a list of apple-related activities at the back of the book. Education.com has a simple recipe for making fresh homemade apple cider. The section of pbs.org for parents has a recipe for hot spiced apple cider that children and adults alike will enjoy. Here’s the link to Danna York’s Facebook Page. Love the idea of the participatory activity element in the book.. Someone in 12x was asking about books without conflict, but I forget who that was…. All of a sudden I am craving cinnamon sugar donuts as well a cider…..this book sounds really unique with the opportunity to draw and create too. We don’t have a very good “fall season” where I live now (unless you travel an hour or so). Since I grew up in the applie capital of Georgia, I should check this one out. I could use some warm cider today. I’m cold. Lovely choice and I’m glad you decided to review it because it warmed my heart! I love fall and I grew up with lots of apple trees in our backyard. I live in the right belt. So this book brings back memories. Thanks for sharing! I LOVE the cover of this book! And what a great idea to have activities in the book! I like that! And I love apples!! So I’m going to have to find this book. Thanks for sharing! I miss apple picking, but love to help my friends when the season comes round. Cider making is fun, but it’s the reward I am always after – can’t get that taste in a bottle! Sounds like a book to fill up the sense, Beth! Mmm. Thank you everyone for the amazing comments~so excited to hear! I am so blessed by Beth and this wondeful book review! Please contact me ~I`d love to hear from you. More book reviews would be awesome!Share if you`d like.Thank you!